When it comes to SEO, good link building is essential. Equally, too, is the importance of checking these links. It’s not enough to build a series of strong links, for example, if you’re not checking they still work. Case in point, Google recently confirmed that the link command is dead. This method of linking (such as “link:” followed by the URL) no longer works. While many webmasters have known this was ineffective, it’s a good reminder that links can still become inactive and need to be checked once in a while. 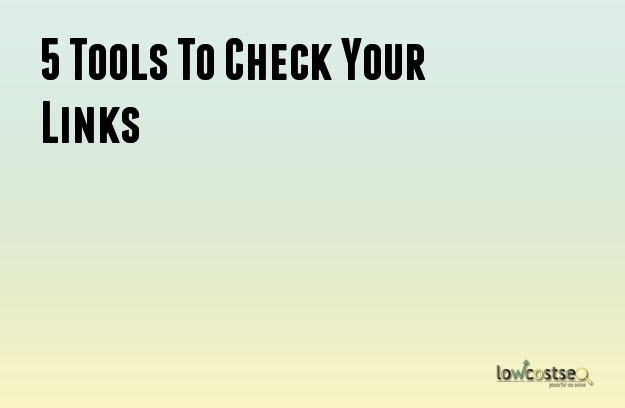 Need to check your links, here are 5 tools to help you! Google offers a number of free services, with webmaster tools being one of them. Similar to search console and other Google services, it’s simple to use and offers a decent amount of information. However, it does tend to be slower than more expensive, third-party services, so it is not the most in-depth tool. That said, the crawl reports let you easily understand your internal links and page strengths. If there’s a specific page you want to check, Check My Links is a very useful plug-in. With a click of a button, it will highlight every available link on a page, using a simple green and red colour scheme to highlight which links work or not. This is handy for any page which might have a problem, but you’re not sure which links are still active or not. Spider SEO is a very extensive tool and part of its usefulness extends to link checking. At a glance, you can see all the information you need about your links, including the anchor text (to help with proper keyword analysis), giving you a quick and simple overview. SE Ranking is one of the cheaper services out there, but it requires a monthly subscription and needs to work alongside Google Webmaster tools. However, it provides very useful data on your inbound links, with a variety of ranking factors. You can even compare a competitor’s ranking, to know if your still active in a given keyword’s search results, for instance. MoonSearch offers a similar service to SE Ranking, although it is free and doesn’t interact with Webmaster tools as much. Still, it offers numerous page-rank factors can let you see how well your links are doing in a general overview. As you can see, there are plenty of tools available to use. You might prefer to use one extensive tool, for instance, rather than numerous different services. Tools like SEO Spider certainly require a small investment, but they can offer an easy way to get detailed information. On the other hand, some of the cheaper – or even free – options here can provide you with enough knowledge to know when a link isn’t working, even if you have to use a few different options.